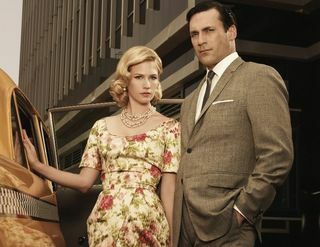 Okay I am a total FREAK for MadMen and the series premier is this Sunday. I'm getting so pumped! I was getting stressed thinking that I don't remember a dang thing from that show since I haven't seen it in almost 2 years ( what kind of a show can do that and get away with it?) but since they have always started each season with a huge gap…normally the time passes and they pick up probably a year later and we are left to fill in all the blanks with our imaginations anyhow I'm thinking I might be okay and don't need to start watching all last season again. I remember the important points, that Don the cad will probably be married to the sweet Quebecer girl that was his office assistant that he got to help look after his children on vacation, or they could be ready to divorce already since he seems to be totally incapable of keeping his zipper zipped for any length of time. The office bombshell and all around she's-so-much-smarter-and-more-put-together-than-you-will-ever-be Joan is having a baby…did she tell anyone that it's Rogers other than Roger? Her extremely good looking but dense as a doorknob fiance (or husband? I don't recall ) will never be able to figure it out on his own. Oh and did you check out the latest offerings from Banana Republic for their MadMen inspired collection?